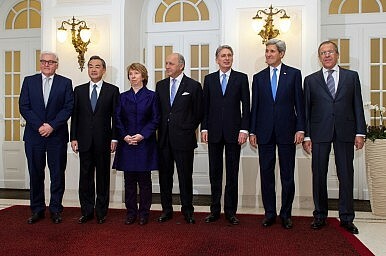 The foreign ministers from Iran and the P5+1 nations in Vienna on November 24, 2014. If nuclear talks fall apart, China is not going to sacrifice burgeoning ties with Iran to reimplement sanctions. Yesterday, policy wonks from all over the world were glued to Israeli Prime Minister Benjamin Netanyahu’s speech before a joint session of Congress. Netanyahu gave a passionate argument against the Obama administration’s efforts to secure a deal in the ongoing nuclear talks with Iran. Commentators have eagerly discussed the politics of Netanyahu’s address and what it means for the Iran talks – and for Obama’s uphill battle to get Congress to buy into a deal. However, lest we forget, there are more interested parties than the U.S., Iran, and Israel (which is not a party to the current P5+1 talks with Iran). The role of other states – particularly China – could prove instrumental to the future of Iran’s nuclear program, regardless of whether a deal is struck. China is eager for a deal in part because it wants free rein to expand its ties with Iran. Beijing was quick to take advantage of the interim deal signed between the P5+1 powers and Iran, which partial lifted economic sanctions. China’s oil imports from Iran were up by 28 percent in 2014. Also in 2014, the two countries announced an ambitious plan to double their bilateral trade by 2017. Bilateral trade in 2013 was worth just under $40 billion in 2013; trade in 2014 was projected to reach $44 billion, representing roughly 10 percent growth year-on-year. China-Iran cooperation also extends to the security realm. Last May, Iranian Defense Minister Hossein Dehghan met with his Chinese counterpart in Beijing. At the time, Chinese Defense Minister Chang Wanquan called Iran a “strategic partner” for China and both sides agreed to expand their military cooperation. Words turned to action in September 2014, when China and Iran held their first-ever joint naval exercise in Iranian waters. China is also interested in having Iran join the Shanghai Cooperation Organization, a regional multilateral body focused on combating the “three evils” of terrorism, separatism, and religious extremism. Current SCO regulations prevent any country under U.N. sanctions from joining, providing even more incentive for China to push for a deal that frees Iran from sanctions. It’s notable that the recent progress in China-Iran relations has come against the backdrop of nuclear talks. The Obama administration pushed hard during its early years to bring China on board in efforts to sanction Iran. However, China-Iran cooperation is blossoming now that hope for a deal is on the way – and ties are not likely to regress, even if negotiations fall through. China will not be eager to undo the progress it has made in its relationship with Iran, especially if a recalcitrant U.S. Congress is what finally torpedoes a deal. If Netanyahu and his supporters have their way, the U.S. will effectively back out of negotiations (or insist on restrictions Iran finds completely unacceptable, which amounts to the same thing) and keep its rigid sanctions regime in place. But it’s unrealistic to expect China to return to the previous level of sanctions, given the recent progress made in its relationship with Iran. If no deal comes out of the current talks, there will be no restrictions on Iran’s nuclear program – and the effect of sanctions will be diluted as China expands economic and military ties with Tehran. What Did China Bring to the Iran Talks? How China, as one of the seven main negotiating parties, approached the Iran talks.